As we step off the jetty the earth crunches beneath our feet, all around us Mother Nature displays her unyielding power. Plumes of white steam rise from craters and above us the cliffs are tarnished with hues of yellow and red. Gases hiss and roar as they escape from the craters littering the ground, contaminating the atmosphere with a primordial stench. Stood on this explosive moonscape we are surrounded by raw irrepressible energy. The chemical atmosphere sickly sweet lingers in the air, a reminder of life on earth at the beginning of time. Although known today by Cook’s descriptive title White Island was first discovered by the Maui settlers some 1000 years ago. While a number of translations of the original Māori have been made it is known commonly as ‘Whakaari’ which means ‘that which can be made visible’, perhaps in reference to the island’s tendency to disappear from the horizon. Bad weather can wipe the island from view to those on the mainland, whereas a clear day will highlight the jagged outline of its volcanic form. 27 nautical miles / 49km from the shores of the Bay of Plenty White Island is an anomaly amongst the surrounding landscape. 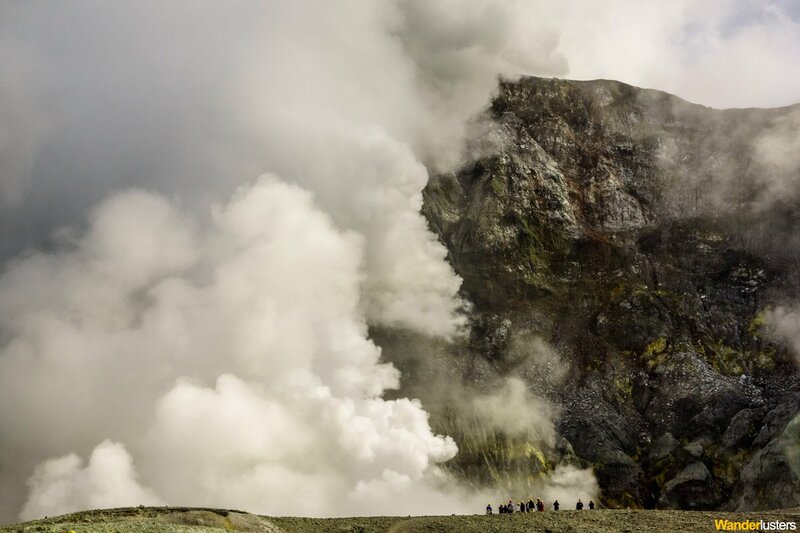 The only active marine volcano in New Zealand it is in a permanent state of unrest facilitating some vigorous displays of geothermal activity to those brave enough to go ashore. Sat along the fracture line of the famous ‘Ring of Fire’ it is part of New Zealand’s Taupo Volcanic Zone along with over 25 other volcanic centres, including the world famous Lake Rotorua and Mount Tongariro. A turbulent environment, visiting White Island is not for the faint of heart or sensitive of nose. 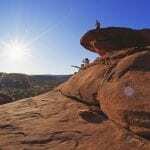 However if you are prepared to brave the tempestuous surroundings you’ll be rewarded with a view like nothing else on earth. As we approach the island gargantuan plumes of white rise from its centre. Although unmistakable as the outline of a volcano the island is a mistress of deception, for below her shores she harbors a deep secret. 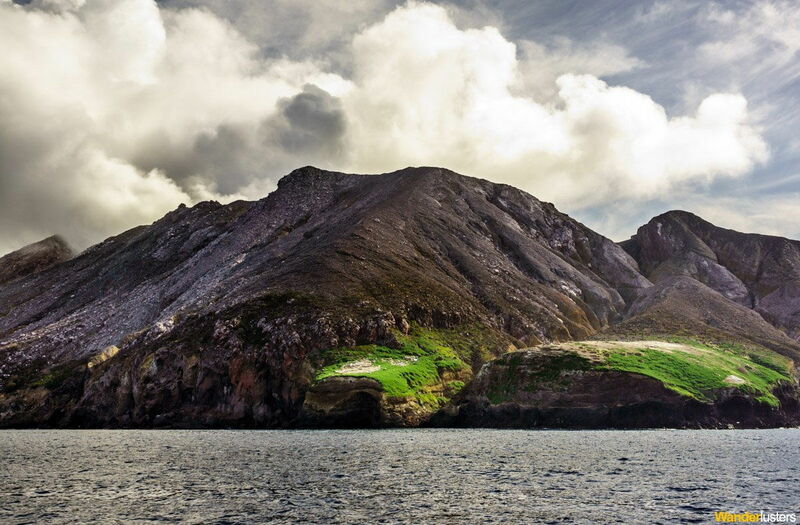 Much like the frozen icebergs to the south visitors to White Island are privy to just one tenth of the mass of this submarine mountain. The rugged coastline displays the effects of the elements on this outcrop. Barren other than a single species of plant that clings to the external edge of the crater, its sheer sided cliffs and windswept shores have remained largely uninhabited. For the twitchers amongst you it may be of interest to hear that the outer slopes of the island are home to large colonies of Gannet, whose presence is all too obvious by the blanket of white droppings that adorn the upper edges of the crater like snow. Entering the relative calm of the newly formed bay we are ferried to the remains of a jetty by a small inflatable dingy. Our guide informs us that they regularly have to rebuild any structure placed in the bay as the swells reach unimaginable heights pulverizing anything in their path. Originally a sealed crater, increased volcanic activity during the early 1900’s led to a landslide of epic proportions which broke through the external wall and flushed everything in its path out to sea. Tragically this included the inhabitants of a small mining operation that had been set up to extract the bounty of sulphur expelled by the constant geothermal activity. Leaving a path of destruction in its wake the remnants of the mine greet us upon our arrival. Twisted steel and decaying concrete litter the ground. 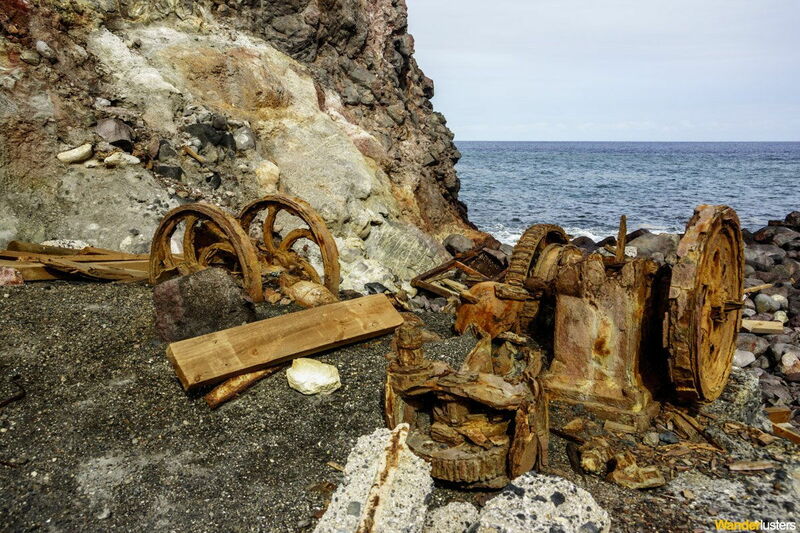 The remains of buildings, machinery and tools lay dormant on the crater floor. 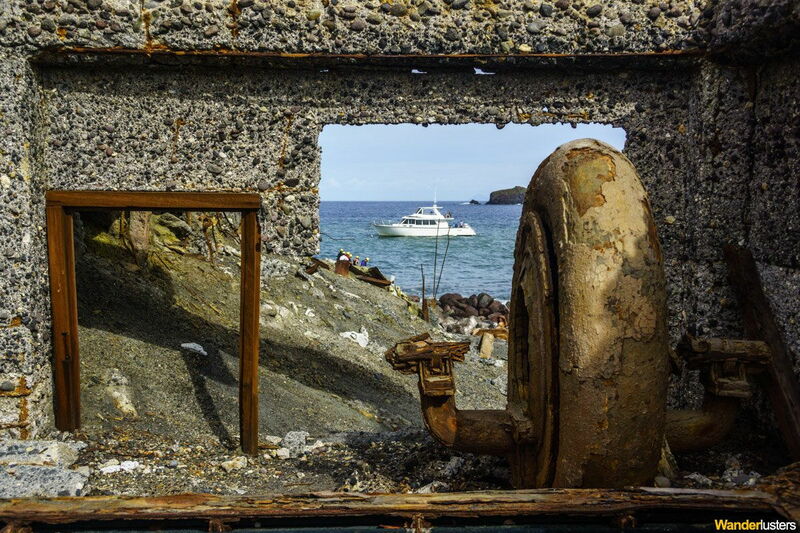 A reminder of the island’s grisly past. 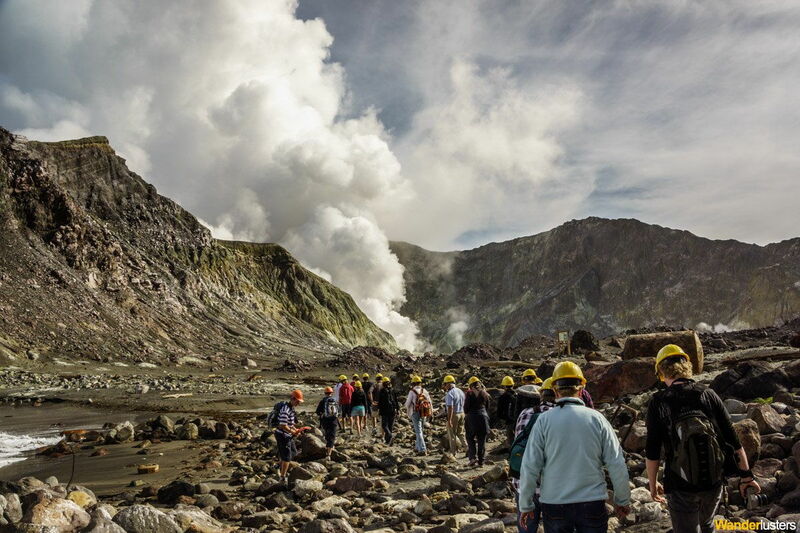 Since its last major eruption in 2002 White Island has been in a state of constant unrest and as such has provided visitors with an incredible display of geothermal activity. Composed of around 60% silica this volcano puts on a rather unusual display when its fiery belly disrupts the delicate balance of life on the surface. Unlike the traditional depiction of a volcanic eruption, black and red magma flowing slowly over the ground, White Island explodes with incredible force sending chunks of igneous rock flying into the air. A continually changing environment the island has been in its present form for the last 16,000 years, a tiny fraction of its existence. Formed over the last 100,000 years by a continual cycle of eruptions this mountainous structure has grown out of the plains of the ocean floor. A hot bed of continual commotion a visit to the crater floor takes you out of this world and into an alien landscape unlike anything you will have experienced before. Giant hills of earth, remnants of the landslides almost 100 years ago, dwarf us as we stand listening intently to the safety brief, and regular bursts of steam erupt from the surrounding pressure mounds. Equipped with hard hats and gas masks we are advised to follow in the footsteps of our guide to assist in the preservation of the crater floor. Deeper and deeper into the carter we walk, the sulphuric fumes gathering in our throats. Transformed with every violent episode no two visits to the island will ever be the same. What were once numerous craters and a lake up to 90 miles deep is now easily navigated on foot in relative safety. Molton sulphur streams that have carved their way across the floor lie still, sulphur chimneys glisten in the sunlight and eruptions of steam occasionally obstruct our the view in front. In the heart of the crater lies what was once a mighty lake. Formed not from the surrounding ocean but a toxic cocktail of condensed gasses and rain water this is not a place to test out your new swim suit. Our guide recalled the tale of a visitor who’s hard hat had fallen into the ‘waters’ within the crater, returning just 24 hours later with suitable equipment to retrieve the durable safety hat they found it to be an unrecognisable wilted plastic form, ravaged by the elements. Sadly the water levels are currently in decline and thus the colours no longer sparkle to the same electric magnitude. As is ever the case with this volcanic being change is constant and never ending, and no one knows what spectacular phenomenon are awaiting discovery on the horizon. During our tour we spotted some rather unusual additions to the landscape. While a rule of ‘take only photographs and leave only footprints’ is strictly enforced while on the island, a few technical additions have been made in a bid to better understand and predict the destructive tendencies of the beast within. Seismograph detection wires, volcanic tremor sensors, solar powered cameras and measuring devices are permanent features amongst the smeared sulphuric earth. 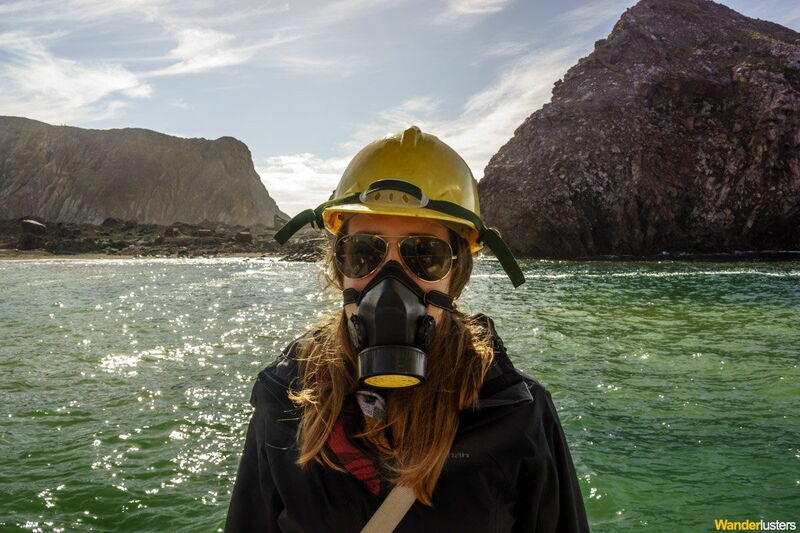 Scientists aim to visit the island each month to record a visual analysis of the environment, perform equipment maintenance and connect on a more personal level with their subject. We heard first hand from our guide just how much the staff of Pee Jay Tours enjoy assisting with the research in a bid to expand their own understanding of the island they visit on a daily basis. For those interested in checking out the current activity taking place on the island you can visit the researchers website and watch the island on their live volcano webcam. It was surprising but very humbling to see the guides taking photographs of their own to record the changes that occur in between their visits. How thrilling to visit such an incredible natural wonder so often that you can watch it evolve. For those on a limited budget we recommend joining the crew of New Zealand family owned and operated Pee Jay Tours. Appointed legal guardians of the island in 1997 Peter and Jenny are one of two licensed operators who take visitors ashore to explore this captivating natural environment. For the more daring there is the opportunity to hop aboard a helicopter and take in the magnificence from the air however this will set you back more than double the cost of the equally impressive marine tour. Pee Jay Tours are on the path to a sustainable future and their efforts to minimize their impact on the island were evident from the moment we checked in. You won’t find any unnecessary wastage in the form of paper tickets, non-recyclable packaging and foreign produce aboard their vessels. Sustainability is a top priority in order to preserve the delicate balance of activity on the island. PeeJay have a great set up to accommodate visitors, not only do they offer the day trip to White Island they also run a well appointed motel and a cafe full of healthy meals and delicious treats. Note: We can vouch for the deliciousness of said treats. Operating the tour daily 364 days of the year the only factor to consider during your visit is the weather. We were advised that the winter months bring calmer seas and cool, crisp sunny days which provide perfect viewing conditions however I’ve no doubt the island is spectacular at any time of the year. Prices per adult are $199.00 and rates for children 13 years and under vary throughout the season. For us the opportunity to get so close to one of the contributing sources of life on our earth was a truly remarkable experience. Despite their often robust appearance the environments that cover our earth are so volatile, reacting to every change in the atmosphere and climate. Hiking to the edge of the great lake and looking back towards the ocean I was struck by just how much this submarine mountain had evolved itself and hoped that the influence of mankind would not undo Mother Nature’s efforts to provide us with a varied landscape in which to flourish. 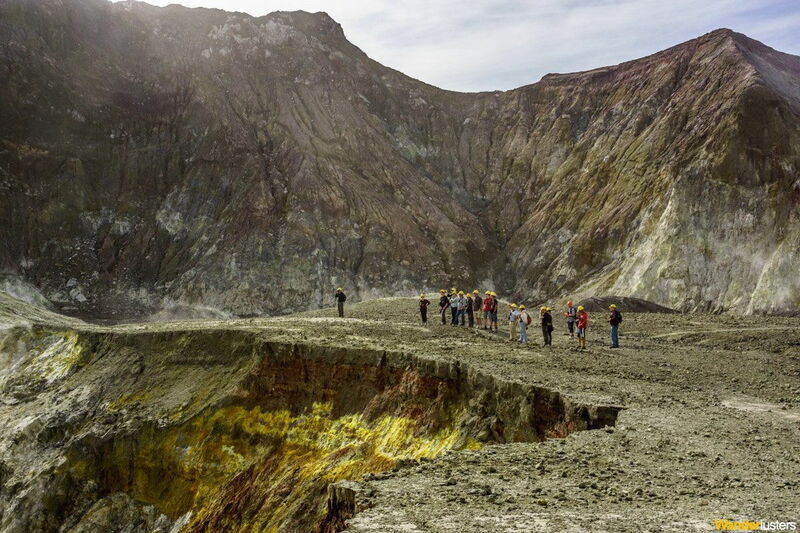 If you’re interested in New Zealand’s volcanic environment we highly recommend this day trip out to White Island and were thrilled with the service provided by skipper Peter and his crew over at Pee Jay tours. For more of geothermal tales, have a read of our feature on the colourful geothermal pools at Wai-O-Tapu. 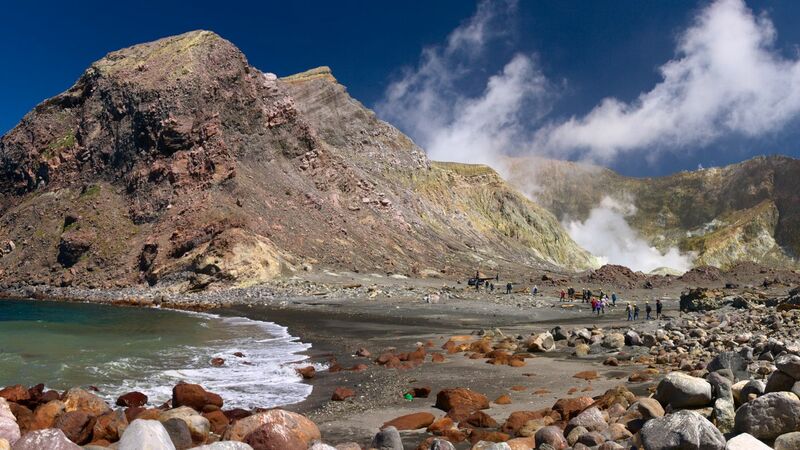 Have you been to White Island and experienced the primordial stink? Share your comments with us below. That looks like an amazing,unforgettable experience. I must admit it was a day I won’t forget in a hurry! It is on my bucket list to visit the volcanic activity on the Big Island while we are here in Hawaii. I forgot that we have our own active volcano on White Is back home in NZ! That sulphur colour looks primordial and awesome, and weirdly I quite the smell e.g Rotarua. Thanks for your comment Kate. It’s funny how we negate to visit the ‘attractions’ in our own backyard! 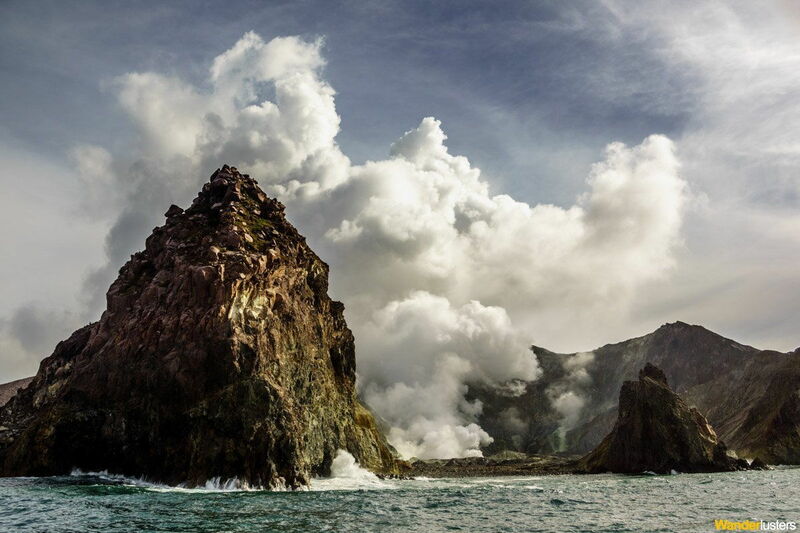 We didn’t get the chance to visit the volcanic centre of Hawaii so you’ll have to let us know how you get on. This tour must have been absolutely fascinating! We spent some time on Santorini, though we didn’t so much learn about volcanic activity as gaze out over the ocean sipping cocktails. I think sipping cocktails sounds rather nice! The volcanic landscape here in New Zealand is just spectacular, with a cold beverage a volcanic view would be the icing on the cake! Although perhaps enjoying it from a safe distance and avoiding the primordial smell is advisable! My dad (the State Geologist of Nevada) travelled to Whakaari a few years ago on a geology/geothermal energy field-trip with the University of Auckland and brought back pictures that looked exactly like these. Unfortunately I was unable to visit this amazing island myself while studying abroad in Wellington, New Zealand in 2011. But I plan to get back there as soon as possible and take some stunning photos of a landscape many never get the chance to see. Oh wow, what a fascinating field trip. I’d love to visit with someone who’s profession is to study the geothermal activity. I hope you manage to make it back there one day. It was such an unreal landscape to visit. I felt like I was walking on another planet! Oh wow, what an incredible experience. I have such a weakness for seeing volcanoes – the more active the better! I know exactly how you feel! treading on such a turbulent surface was quite exhilarating. It’s incredible to think of the power at work just below your feet. Thanks Dave! It felt like an alien world, smelt like one too! Wow, i have always wanted to try and explore a volcano. This environment just look like you’re into another realm or planet. Volcanic activity has always fascinated me, so I’d love to visit White Island. Incredible that a single family are caretakers of the island. What a beautiful place – and as we always learn, Nature’s in charge, yes? 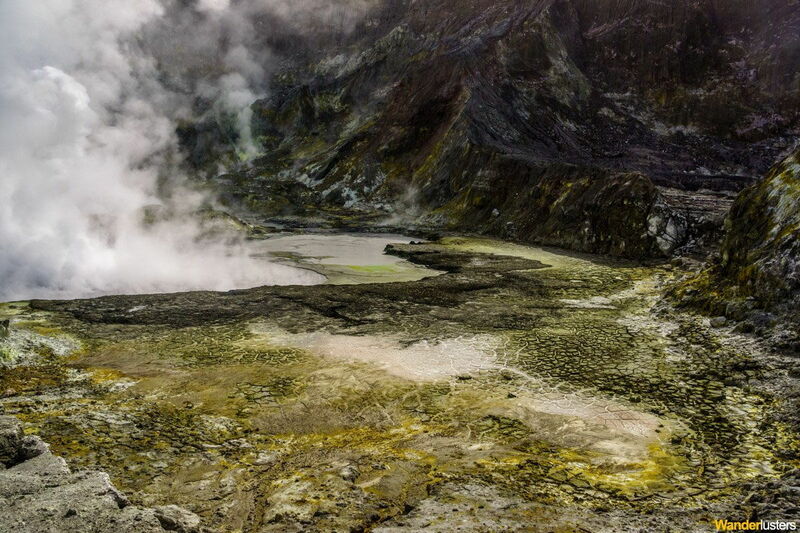 Hiking White Island Volcano seems like an other worldly experience. Thanks for sharing your unique experience- gas masks and all. What an amazing place that I didn’t know existed! Sounds like the ultimate adventure activity and the pic with the gas mask is just so much fun! Adding it to the list right now! Great article! I had no idea you could hike any active marine volcanos. Putting that on my itinerary, thanks!